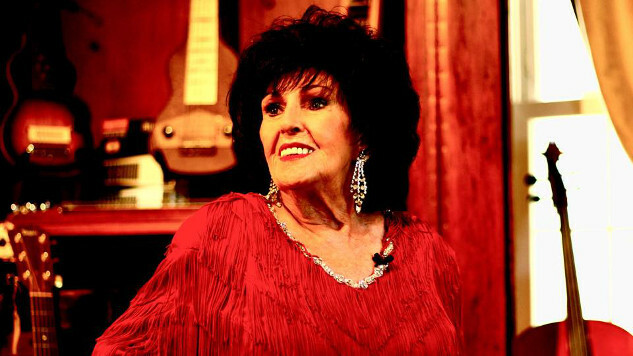 Wanda Jackson’s career has spanned multiple decades and genres, from her first radio gigs as a high school student in 1952 to her more recent appearance alongside Jack White on Late Show with David Letterman. The Queen of Rock and Roll got her first break with the King of Western Swing, Hank Thompson, before going on to tour with another king, Elvis Presley, in 1955. Elvis encouraged her to embrace rockabilly music, and her recording of “Let’s Have a Party” was a top 40 hit, and remains her most iconic song. She has subsequently hit the gospel and country charts, performed in Vegas, and reconnected with her rockabilly roots in a mid-1990s tour with Rosie Flores. At 78, Jackson continues to tour the world, and is working on a new record due this year in collaboration with a secret celebrity producer. Given the fact that Jackson has been on the road since the 1950s, it will come as no surprise that she hasn’t spent much time in the kitchen. But she makes a mean bologna and cheese sandwich. Paste chatted with Jackson about bologna sandwiches, Throat Coat tea, “googely gop,” and Christmas dinner, which she did not cook this year, at her family’s adamant request. Paste: You’re at a truck stop, you’re starving, and you have five minutes to assemble a meal. Please describe that meal, and how you feel about it. Wanda Jackson: Beef jerky, powdered doughnuts and a coke! We take what we can get! Paste: When you’re traveling, what food from home do you crave? WJ: I miss my daughter Gina’s spaghetti and meat sauce, salad and garlic bread! Paste: Is there anything special you like to eat before you play a show? Or anything you definitely do not like to eat before you play? WJ: I can’t eat anything heavy. I wait to eat until after the show, if there’s anything open. Paste: Do you have any superstitious pre-show drink rituals? WJ: I drink Throat Coat tea before every show and a glass of cold white wine after the show. Paste: How has food in America changed during your years as a touring musician? WJ: The portions are much larger so I constantly have to watch my weight. Paste: Can you tell me about a meal or a particular food that you were supposed to like but didn’t? WJ: I love cheeseburgers. Once when we were in Germany, our friends took us out to their favorite place for cheeseburgers. They served it to me and it was literally raw! It had never even seen any heat! Paste: What’s the most important food or drink item in your rider? WJ: Throat Coat herbal tea. Paste: What restaurant in the world do you most look forward to visiting when you’re on tour? What do you like to eat there? WJ: Either Red Lobster or Olive Garden. At Red Lobster I love the clam chowder, cheese biscuits and The Admiral’s Seafood Platter, which my husband and I share. At Olive Garden I go for eggplant parmesan, salad and breadsticks. Paste: Can you share a memorable on-the-road food story? WJ: One particular meal comes to mind. My husband, Wendell, is an excellent fisherman. When I was on tour in the Faroe Islands, he decided to go fishing and ended up bringing in a very large catch. The hotel chef was gracious enough to prepare an entire meal for us with the fish Wendell had caught as the main dish. It was enough to feed the band that was backing me, the promoter, Wendell and myself. It was unique because it gave us time to all sit down at a table and have some great conversation. As a touring musician, you know how rare it is to have time to actually sit down and have a nice meal while on tour. Our conversation was mainly about the unique culture of the islands. It is very heavily Christian-influenced…no alcohol is sold anywhere on the islands. Paste: What about your worst on-the-road food? WJ: After 60 years on the road, I’ve been served a lot of googely gop! Paste: What’s googely gop, exactly? Can you think of any particularly bad googely gop meals? WJ: Truck stop meals! I’ve toured the world for so many years…I’ve been served many meals where I don’t even know what’s on my plate! In Japan, every meal was a challenge. One Japanese run, I was on tour with a girl named Connie who is a big Japanese star. She and her tour manager took us around to their favorite places to eat. My husband would get served a meal and just stare at it for about three minutes. If it hadn’t crawled off his plate after the three minutes, he would eat it! It’s a joke he still tells to this day. Paste: What’s the best meal you’ve had lately? WJ: We recently had dinner at Grotto in the Golden Nugget in Las Vegas. Their lobster ravioli was amazing. Paste: Do you have any special dish you always make for Christmas? WJ: My family knows better than to ask me to cook for Christmas dinner! They asked me one time and never again. It’s a running joke in the family that my timer is the smoke alarm! Paste: What’s your favorite thing to cook or bake? Do you have a specialty? WJ: I make a mean bologna and cheese sandwich…best in the Southwest! Two pieces of wheat bread with mayo, Oscar Mayer Bologna, a slice of American cheese, lettuce, tomato, and onion. Cut in half, of course! I have to eat like a lady! Freda Love Smith is a drummer, Northwestern University lecturer, and the author of Red Velvet Underground: A rock memoir, with recipes. She blogs about food here. Follow her on Twitter.